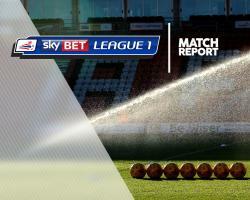 Rochdale ended their 10-game winless run by beating 10-man Gillingham 4-1 at Spotland. Man of the match Nathaniel Mendez-Laing fired Rochdale ahead with a goal of real quality in the 10th minute, cutting in from the right before finding the top corner of Stuart Nelson's net with a venomous finish. Mendez-Laing and the rest of the Dale team celebrated by holding aloft Joe Thompson's shirt in recognition of their team-mate's current battle with cancer. The Gills frontman side-footing the loose ball into the roof of the net from close range. Cody McDonald was denied by home goalkeeper Conrad Logan while Ian Henderson headed Joe Bunney's cross against the post at the other end. But Henderson restored Dale's lead in the 32nd minute when he raced through onto Mendez-Laing's flick on and lifted the ball over the oncoming Nelson. That man Mendez-Laing was instrumental in Dale's third goal in the 48th minute, breaking from his own goal area to race the length of the field before squaring for Callum Camps to tap home from six yards. The Gills were reduced to 10 men in the 58th minute when Zesh Rehman received his second yellow card for a challenge on Mendez-Laing. Peter Vincenti completed the scoring when he bustled his way through in the 89th minute.